Why Did We Save Grin Low Tower aka Solomon’s Temple? 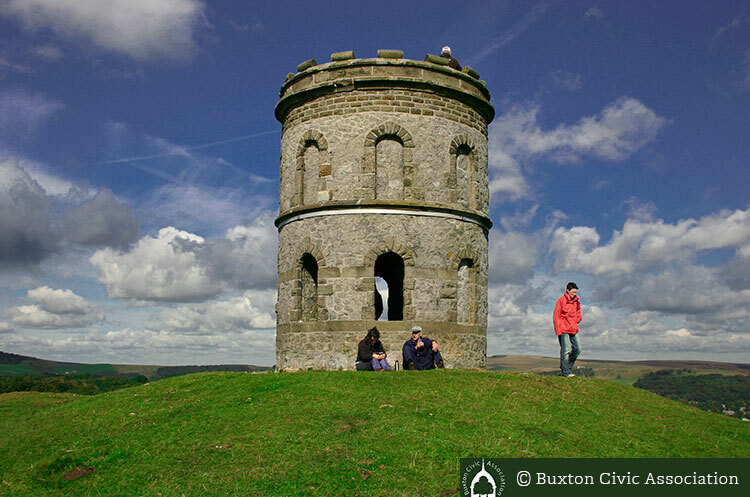 Buxton is fortunate in its inheritance of historic buildings set in beautiful countryside. The price of keeping them is constant vigilance and our Civic association is one of Buxton’s ‘watchdogs’. The aims of BCA are exemplified in its relationship with one of Buxton’s high spots – Solomon’s Temple. It has long been recognised that locals and tourists are attracted by a focal point to walk to and connect with. There has been a Temple or Tower on Grin Low Hill for 150 years. It is recorded in William Adam’s book Gem of the Peak in 1838. He said ‘it forms a conspicuous and interesting object from Buxton’. It was built to ‘afford occupation to the unemployed of Buxton’. Croston’s guide of 1865 stated it was ‘built to resemble at a distance a ruined tower.’ But by the end of the century it ‘had succumbed to wind and became a mere heap of stones.’ (W.M.Turner) Amongst these remains an ancient Bronze Age barrow was discovered displayed at Poole’s Cavern and in Buxton Museum. Today we continue to raise awareness of planning issues that will affect the future of our unique town. We are currently being invited to take part in consultation to help to shape the future of Buxton. We should all take up the invitation and give our views individually as well as through BCA. It would be so good if BCA could encourage High Peak Borough Council to develop their logo from ‘working for the community’ to ‘working with the community’. Proposals to build three houses in the Serpentine, with resulting detriment to a valued community facility, are a case in point. It has to be assumed that these proposals are based on a rational judgement by the Council but it has proved very difficult engaging with them. They initially wanted to make their planning decision before the closing date for comments. Other things have also made it difficult to contribute to the Serpentine Proposals which have just been withdrawn – but for how long? The proposals might be driven by the need for a ‘cash strapped’ Council to gain revenue even at cost to our heritage – it is not clear but if cards are put as openly as possible on the table then the creativity of the community is able to be tapped and a great idea may emerge.